Passenger platforms and buildings demolished. Goods loading bank is standing immediately south-east of the level crossing on the up side. The signal box base, south-east of crossing on down side, is retained as a relay room. Notes: Lucker was quite remarkable as station of no importance yet possessing a building magnificent both in size and decoration; some of Britain’s towns were given inferior station buildings. Lucker was favoured because of a covenant made between George Hudson, who controlled the N&B, and Hugh, 3rd Duke of Northumberland. 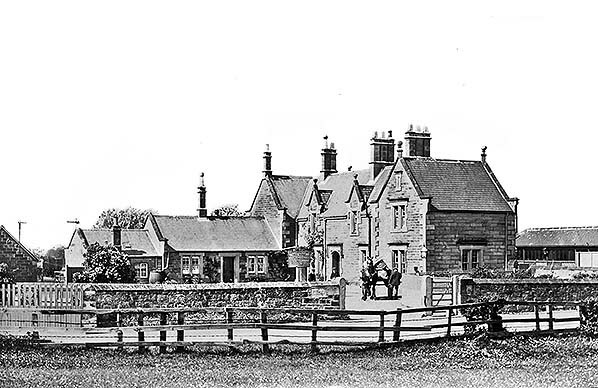 The Duke owned substantial stretches of land that the railway would cross, and he insisted that Lucker, which served the coastal townships of Bamburgh and North Sunderland, should be a ‘first-class station’, together with Warkworth, a ducal domain , and the station at the Alnwick branch junction. (See Fawcett in Addyman [Ed] 2011). 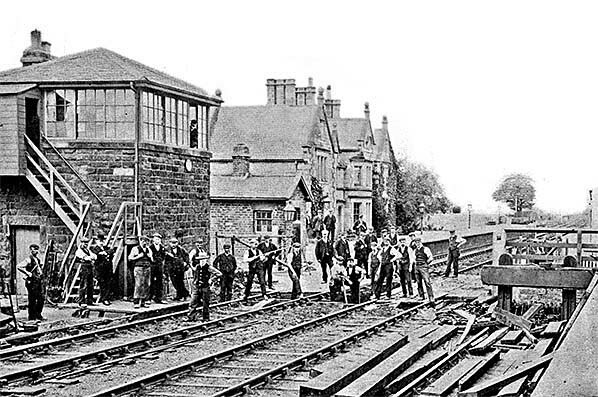 Lucker was one of the original stations provided on the East Coast main line when it was opened in 1847. The route through northern Northumberland crossed lightly populated countryside, failing to serve any of the area’s villages conveniently as it followed as direct and gently graded a route as possible northward to Berwick. The village of Lucker was about half-a-mile south-west of its station. The well-known, picturesque coastal village of Bamburgh, capital of the medieval kingdom of Northumbria and dominated by its heavily restored castle, was about four miles east of the station. Although Lucker was the closest station to Bamburgh, the next station north at Belford was officially recognised as ‘Belford, for Bamburgh’. Lucker station was provided with a characteristically opulent Tudor/Jacobean Newcastle & Berwick Railway building, and was among the finest of them. It was built of buff-coloured sandstone with a smooth ashlar finish, and it possessed two storeys. The N&B station building plan was most commonly H-shaped, as seen for example at Longhirst and Killingworth; the other plan, with a projecting centre on the platform elevation and a two-storey canted bay corbelled out to carry the gable above, was seen at Chathill and Stannington. Fawcett (2001) notes that both of these plans were combined with impressive effect at Lucker, yet the elaboration did not result in any great increase in the cost, which was £1219 compared with £1119 for Chathill. The platform elevation was further enhanced by gabled windows on either side of the projecting centre which, like the other gables, received the N&B decoration of ball finials. The gables ended with prominent kneelers, and the roofline was enlivened by tall chimneystacks. The forecourt elevation lacked the projecting central section, but the two gabled windows seen on the platform frontage were repeated facing the forecourt. From the northern wing a single-storey ridge-roofed section, reminiscent of local rustic cottages, extended perpendicular to the main building’s alignment and it continued further west with a lower roof. Each of the roofs was surmounted by a chimneystack. Altogether, the composition of the station building was fascinating. The main building was on the down (south-west) platform, and on the opposite, facing platform was the standard pent-roof stone waiting shelter, the slope of the roof being down towards the platform edge. It is understood that the shelter was originally open but that here, as at other ECML stations in Northumberland, the North Eastern Railway closed it in with a timber-and-glass front. In May 1849 the frequency of Lucker’s train service was shared with the other minor ECML stations in Northumberland and was provided by what had become the York, Newcastle & Berwick Railway (YNB). Between Newcastle and Berwick only Morpeth, Acklington, Lesbury (for Alnwick), Belford and Tweedmouth were served by more trains. The signal box at Lucker was constructed by the North Eastern Railway in 1873, replacing a ‘Ground Cabin’. 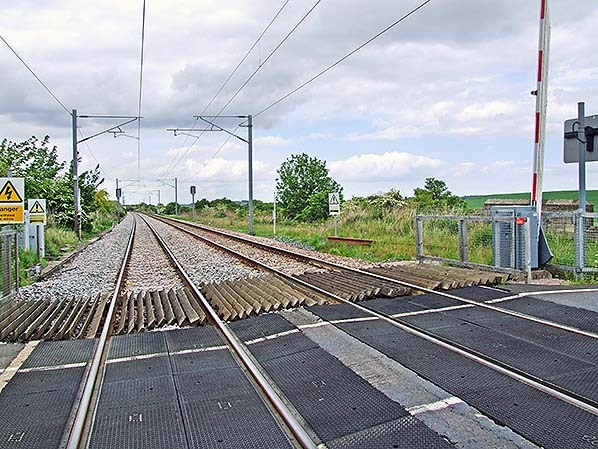 It was located south-east of the level crossing on the down side of the line and was an N1 design with a stone base and a special low window for the crossing. 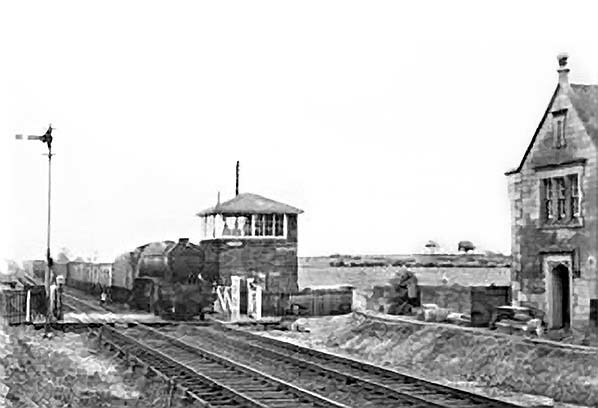 By the 1870s Lucker had freight handling facilities both to the north-west and south-east of the level crossing. On the down side, north-west of the crossing, were four sidings trailing from the main line, two of which served the coal depot. The goods loading bank and associated sidings were south-east of the crossing on the up side, but there was no goods shed. The Railway Clearing House Handbook of stations (1904) indicates that Lucker could handle the normal full range of goods traffic and was equipped with a 15cwt capacity yard crane. In 1913 NER data refers to barley and livestock as the main goods traffic handled; unusually for northern Northumberland there was no stone traffic. In March 1898 troughs were installed north of Lucker to enable locomotives of express trains to take up water while travelling at speed, rather than spending idle time at a station using a water crane. With the demise of steam haulage in the 1960s they were taken out of use on 18 August 1969 and subsequently dismantled. One of the photos in the gallery below shows the troughs in place in 1955. The first northbound departure of the day is shown to run as far as Beal; this train waited at Beal for about half-an-hour, moving off the main line to enable a northbound express to call, before completing its journey to Berwick. Passengers on the 10.19am ex-Lucker could change at Belford or Beal to catch this faster train to Berwick or onward to Edinburgh. In 1923 the North Eastern Railway ceased to exist and its assets became part of the new London & North Eastern Railway. As an economy measure this little-used station ceased to have its own stationmaster and by the mid 1930s was supervised by Belford. It is likely that the LNER replaced NER nameboards with its own, but no photographic evidence has been seen to support this. The winter 1937-38 timetable, below, shows a similar frequency of trains to the 1912-13 service, except that there was no longer an augmented Saturday service. In 1951 Lucker station sold only 277 tickets – about one per day. Its closure to passengers on 2 February 1953 will have caused little inconvenience to the local populace. Goods traffic continued to be dealt with until 7 June 1965. 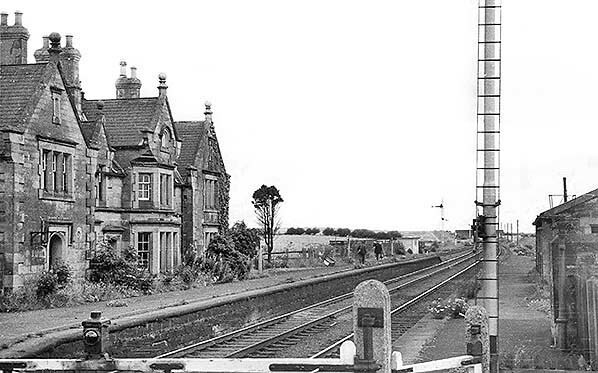 The passenger platforms at Lucker were removed c1959 and the station building outlasted them for only a short time. 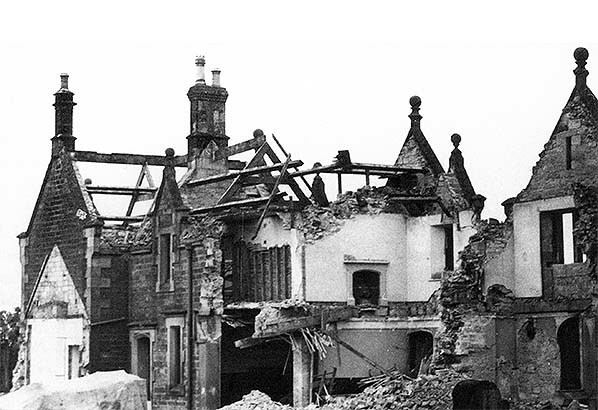 It is regrettable that the fine building was demolished in summer 1960, but fortunate that the NER’s historian Ken Hoole was on hand to photograph the vandalism (as seen in the gallery below). 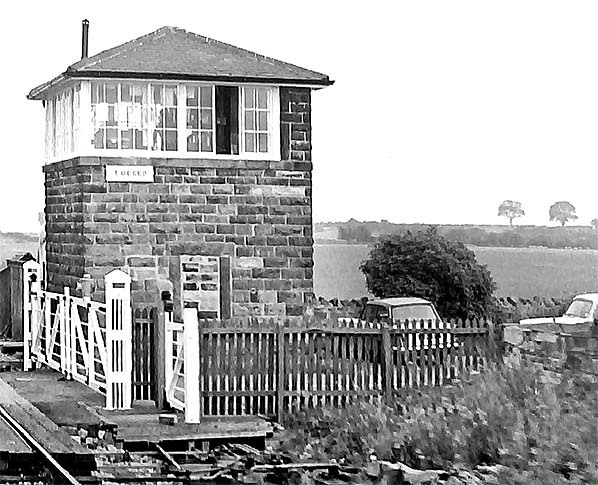 The signal box remained in use, with a new frame at the back of the cabin installed in 1959. The box was decommissioned on 20 August 1978, barriers having replaced gates at the level crossing several weeks earlier, on 3 June. 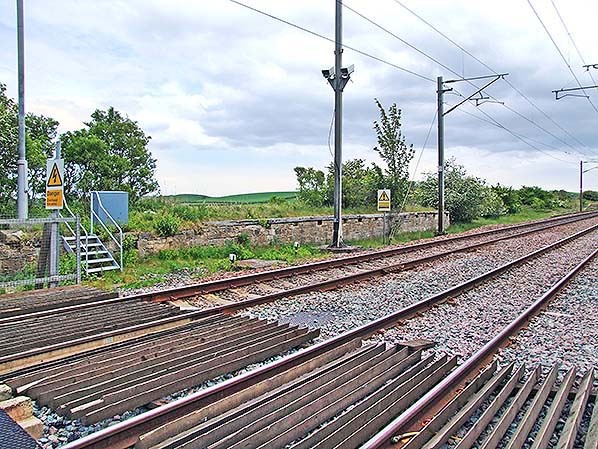 Chathill signal box took over supervision of the crossing by CCTV when Lucker box closed. At Lucker the stone base of the signal box survives as a relay room, and the goods loading bank is extant on the opposite side of the tracks. 1867 1: 2,500 OS map. The station stands alone in the countryside, the village of Lucker being about half-a-mile southwest. The passenger facilities are north-west of the level crossing, with the station building on the south-west (down) platform and a waiting shelter on the opposite platform. The coal depot is served by sidings behind the down passenger platform, and the weigh office (WM=Weighing Machine) is nearby. The goods facilities are on the up side, south-east of the level crossing. No goods shed is provided. 1897 1: 2,500 OS map. The signal box is now shown immediately south-east of the level crossing on the down side of the railway. A pair of semidetached railway cottages has been built south of the station building, but no other habitation has appeared in the vicinity. 1924 1: 2,500 OS map. Little has changed since the map of a quarter of a century earlier. Another railway cottage has been added to the two shown on the previous map, and a building has appeared in the coal depot area behind the cottages. The railway facilities remain in splendid isolation, no housing, commerce or industry having been attracted by the presence of the station. This and the picture above are the only photographs discovered so far which depict Lucker station while it was open, and this is on a postcard sent in July 1908. The forecourt of the station is shown clearly, with the substantial station building in the ‘Jacobethan’ style dominating the scene. Its smooth, coursed stonework, decorated gables and tall chimneystacks can be enjoyed. The single-storey sections at right angles to the two-storey structure are more in keeping with vernacular cottage architecture. The presence of a horse and awkwardly loaded cart, attended by a cloth-capped man, seems to have attracted some onlookers. The stone-built waiting shed on the up platform is visible on the right; it has been closed in with timber and glass by the North Eastern Railway. 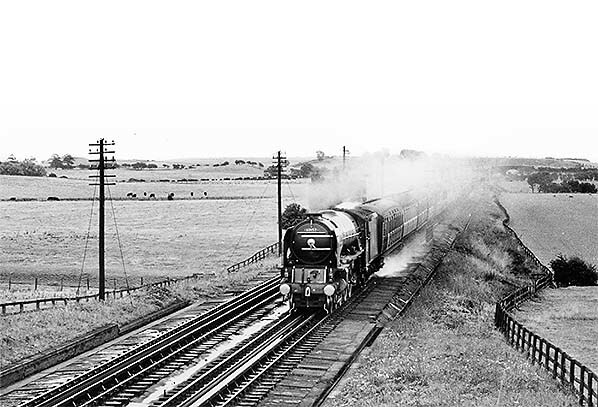 Lucker Troughs are seen in August 1955 with Class A1 No.60152 ‘Holyrood’ travelling north. The troughs were installed between Lucker and Belford stations in March 1898 to enable locomotives of express trains to take up water while travelling at speed, rather than spending idle time at a station using a water crane. With the demise of steam haulage in the 1960s the troughs were taken out of use on 18 August 1969 and subsequently dismantled. The Peppercorn-designed 4-6-2 locomotive was built at the BR(NE) Darlington works in July 1949 and was initially based at 64B, Haymarket shed in Edinburgh. She was withdrawn on 21 June 1965 from 50A, York North shed, to be cut up the following August by Cashmores, Great Bridge. Lucker station looking north-west from the level crossing in 1958, five years after it had closed to passengers. The enormous ‘Jacobethan’ station building on the down platform is one of the finest designed by Benjamin Green for the Newcastle & Berwick Railway, and this lavish provision was required by a covenant made between the controller of the Newcastle & Berwick Railway, George Hudson, and the Duke of Northumberland. It combines the pair of projecting wings, found on a number of the N&B stations, with the central projecting bay windows and gable seen at Chathill and Stannington, resulting in a building of great dignity. On the up platform the stone wall of the waiting shelter can be seen, with a lamp standard and empty lantern cradle and a signal post in the foreground. We are fortunate that the photographer visited just in time to record the platforms (which probably were removed in 1959) and the buildings which were demolished in 1960. Lucker station looking south from the remains of the up platform, c1959. The down goods train is passing the signal box. Both platforms have been demolished but the station building, whose south-eastern wing is visible, is still in place – but for not much longer. Demolition of the main building is in progress in July 1960, as an unidentified ‘Type 4’ English Electric diesel loco (later Class 40) hauls an up train through the Lucker station. The NER N1-style signal box – and the signalman - are seen in the left foreground. 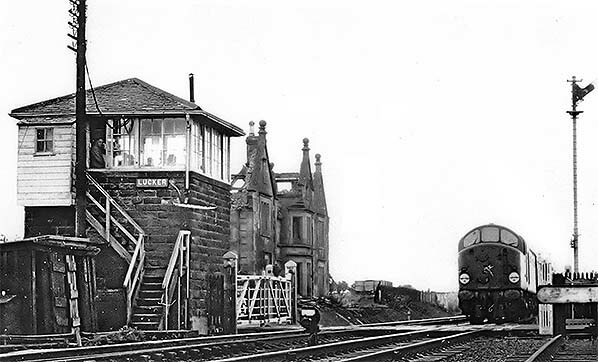 Lucker crossing gates and signal box on the down side of the tracks, looking south c1970. The N1-design box was constructed by the North Eastern Railway in 1873 and was to close in 1978, shortly after the gates were replaced with barriers. 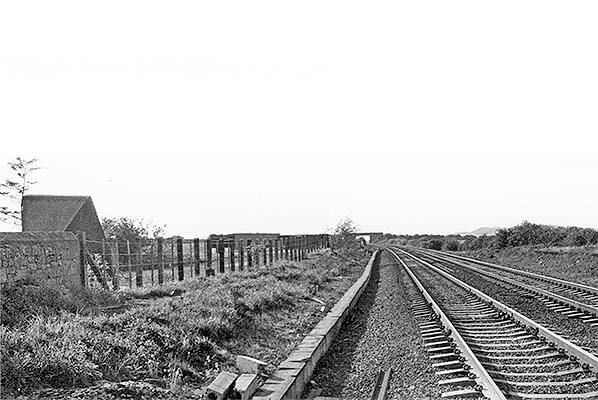 Looking north-west at the site of Lucker station c1971. The site of the down platform is on the left, and a short section of its back wall can be seen. On the right, the up platform has also been demolished. 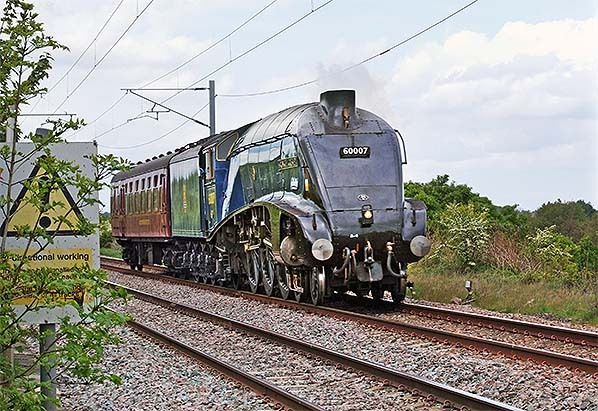 On 19 May 2009 A4 Pacific (4-6-2) No.60007 ‘Sir Nigel Gresley’ has just surprised the photographer by appearing at Lucker level crossing, hauling a single coach southwards. The derelict goods loading bank is behind the loco. The Gresley-designed locomotive was built at the LNER’s Doncaster works in November 1937, and it first carried the number 4498 but was later renumbered ‘7’. After nearly 30 years of prestige main line service she was withdrawn from 61B, Aberdeen Ferryhill shed, on 1 February 1966. The loco is owned by the Sir Nigel Gresley Preservation Group and has worked on heritage and main line railways. The former goods loading bank is still in place south-east of the level crossing on the up side of the main line tracks at Lucker station, but it has been colonised by vegetation. Goods traffic ceased in June 1965 and this photograph was taken in May 2009.